"It produces the quality of compost that costs around £15 a bag if you buy it in the shops." A unique and amusing HOTBIN composting experience from a chicken’s point of view where Hendrix explains all about how her Mummy composts chicken waste and other matter using the HOTBIN. All Mummy's previous attempts at composting ended in disaster. The heap she constructed on her first allotment was invaded by wasps, leaving her running for her life when she accidentally disturbed the nest. An extended family of mice made their home in her first "cold" bin and the family dog destroyed her next, open-boarded venture. She forgot to turn the rotating bin so the contents turned to concrete and the smell created by her state-of-the-art Bokashi bins in her kitchen evidently had to be experienced to be believed. So, despite the seemingly high cost of the HotBin, she was ready to try anything. 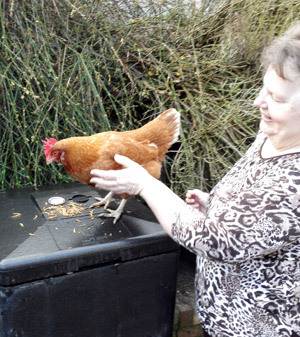 She was really pleased at how easy the HOTBIN was to set up, and was soon filling it up each week with a mixture of our chicken poo and bedding, grass clippings, kitchen waste, and cardboard. Just like the instructions indicated, things didn't really get hot until the bin was over half full, but then, with the help of the hot water bottle, things really started to take off. Weekly readings of over 105 degrees! She was soon removing a large bucket load of lovely compost every month and taking it to the allotment. The result was abundant growth wherever she put it. This was particularly evident in her 'raised beds' of recycled car tyres which this year produced a show stopping crop of pumpkins! Mummy loves her HotBin. It is so easy to look after. It can't be invaded by pests. It is dog and children safe. It doesn't smell. You can put anything in it (Yeah, even dead chickens, Tee Hee. Ed). It produces the quality of compost that costs around £15 a bag if you buy it in the shops. She reckons that the bin pays for itself within 2 years, thus offsetting the high start-up cost. And we hens are honoured to be a part of it all.